Lorraine is the only woman to have run and completed all the Olympic marathons for women last century. She represented New Zealand at four consecutive Olympic Games commencing with the first marathon for women in the 1984 Los Angeles Olympic Games through to the climax of her career, an Olympic bronze medal in the marathon at the 1992 Barcelona Olympic Games. She is also three-time winner of the Avon and Osaka marathons and a Boston marathon winner. 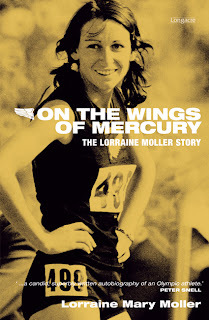 Now based in Boulder, Colorado as a running coach and author, Lorraine recently completed her autobiography On the Wings of Mercury: The Lorraine Moller story and it debuted at Number 2 on the New Zealand Best Sellers List just before Christmas. Please RSVP by email to Gill Gray, Aquafins New Zealand aquafinsnz@xtra.co.nz to secure your seat. Lorraine's autobiography "On the Wings of Mercury" will be on sale and for autograph and Aquafins will be on display and available for purchase.